A major motor sport event is to take place in Down at Easter. 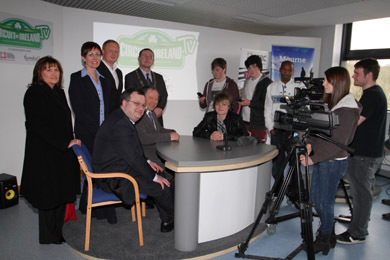 Minister Stephen Farry joined students at SERC’s new state-of-the-art media centre in Ballynahinch to celebrate the launch of the ground-breaking internet television channel circuitofireland.tv which is to cover the Easter Stages Rally. The brainchild of Bobby Willis, the Event Director of the Circuit of Ireland Rally, and with the help of Tyndall Productions and students from the NI Film School, have played a pivotal role in the development of the innovative channel which will stream live footage and programming from the Easter Stages in real time, across the world on Saturday 30 March. DEL MInister Dr Stephen Farry seated left front, launched the TV coverage intitiative of the Easter Stages Rally with SERC media students at the NI Film School in Ballynahinch. This is a significant development in motor sport and will enable unrestricted opportunities to watch the live rally thrills and spills as they unfold while projecting images of Northern Ireland’s stunning countryside all around the globe. 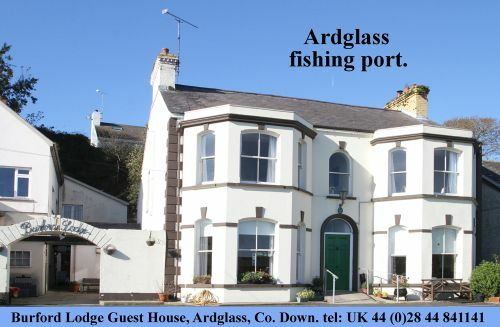 The channel will be aired for 12 hours from 9am until 9pm on www.circuitofireland.tv from a purpose-built, industry-standard studio at the Millbrook Lodge Hotel in Ballynahinch. Broadcaster Alan Tyndall and Pamela Ballantine will anchor the programme. The SERC students have been involved in the project since its beginning and have gained invaluable experience in a wide range of roles, including interviewing, presenting, camera work and sound ans studio engineering. Cambell Miller, Assistant Head of School, said: “SERC’s Film School is the first of its kind in Northern Ireland. Our students are among the best equipped to take on this challenge. The Triton Showers Easter Rally will provide a great opportunity for them to showcase their ability, and the experience will serve them well when they enter the working world”. Programming will include live streamed footage from the rally stages including ‘on location’ reportage from the start in Lisburn, and the finish in Ballynahinch; capturing and transmitting all the energy of the event along with the highlights like the ceremonial spraying of champagne. A large crowd is expected to arrive at the Market Square in Ballynahinch for the podium ceremony and there will be a carnival atmosphere in the town that evening. At the launch of circuitofireland.tv at the NI Film School in Ballynahinch, DEL Minister Dr Stephen Farry is pictured with Bobby Willis, Circuit of Ireland Event Director, right. An additional six cameras will be located within one of the stages, providing almost one mile of live coverage from a specially selected stretch of road. Viewers will be in for a real treat with the opportunity to see competitors tackle four massive jumps, a tight hairpin, as well as a mixture of other challenges – all set against Northern Ireland’s lush and dramatic landscape. Rally result updates will also be broadcast every 30 minutes on the channel. Interviews and other event features will also be aired throughout the day. The Easter Stages Rally replaces the Circuit of Ireland International Rally which was postponed for 2013. Bobby Willis said: “Coverage of the 2012 Circuit of Ireland netted nine million television viewers worldwide. That’s nine million people who witnessed the beauty of our Province within a sporting event. It was an unbelievable success. “When it became clear that the Circuit of Ireland would not run this year as a round of the FIA European Rally Championship, there was a huge demand for an Easter event, and whetted by 2012, there was also a greater appetite worldwide to see rallying from Northern Ireland. And that inspired this project. And he has more good news for rally fans. Bobby added: “I’m working hard to bring the Circuit of Ireland back as a European Champiuonship event in 2014. Our vision for circuitofireland.tv is long-term so I’m delighted at this opportunity to work alongside our sister event Triton Showers Easter Stages. It’s a very exciting concept with far reaching benefits for both rallying and Northern Ireland on the world stage”. Chairperson of Down District Council, Councilor Mickey Coogan, said: “We look forward to welcoming the Easter Stages Rally to Ballynahinch and are delighted to be supporting this exciting event. “This provides a unique opportunity for the thousands of spectators to witness the fantastic spectacle on our own doorsteps and enjoy the national and international rally drivers demonstrate their skills and abilities as they navigate through our beautiful countryside and finishing up at Market Square in Ballynahinch.